Show’s Over – but what a Show! 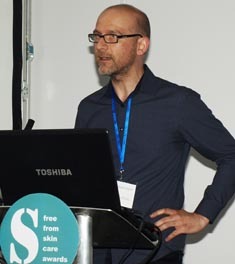 For the second year running following the announcement of the results of the FreeFrom Skincare Awards – which took place on Friday 4th July 2014 at the Love Natural, Love Organic Show at Olympia – it was comments such as the one above that we heard time and time again – much to our delight, it must be said! 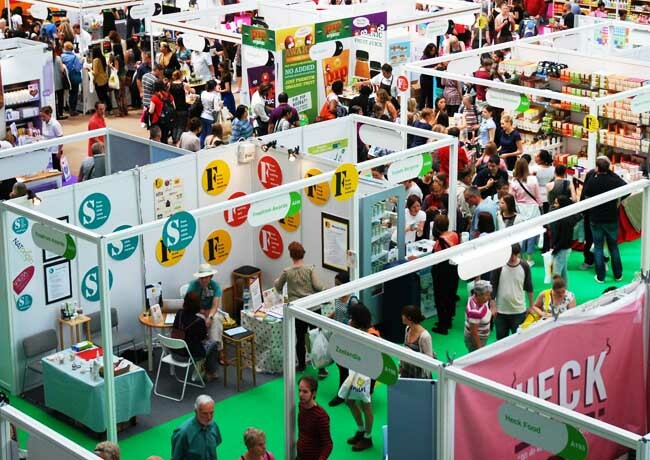 Last year it was the likes of Thea Skincare, Gentle Green, Eve of St Agnes, Suti, Live Native and Le Belle Skincare who took golds along with larger brands such as Barefoot SOS and Essential Care. And this year? 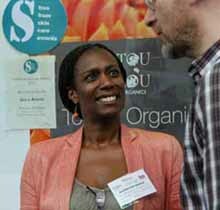 Toulou Organics (here is Andrea from Toulou with her ‘gold’ certificate already pinned up on her stand), Nom Nom, Lyonsleaf, Elixirs of Life and Blend Collective shared the limelight with the likes of Green People, Tropic Skincare, Faith in Nature and Lavera. We’ve always seen ourselves as the friendly and accessible skincare awards – open to brands large and small, but particularly keen to attract the smaller brands, possibly just starting out, and we hope that our slightly reduced entry fees to the ‘one-woman band’ – or ‘two-woman’ or indeed ‘two-man’ bands – enable them to take part in an award they may not otherwise be able to afford. But from then on it’s a level playing field: judges are independent and not influenced by the size or reputation of an entrant; while our testers are interested in the products and the products only – they aren’t swayed by who our sponsors are, or our advertisers are, who we know in the industry, who we work with, or anything else. Often, they won’t know who these are anyway! They are just swayed by the performance of the products put in front of them and with which they ‘live’ for a month. And if those products are good – no matter whose name is on them – then they do well, and may well win. We will never give awards by ‘public voting’ – which favours companies with large fan bases, wide distributions and substantial social media marketing budgets. We will always do it as fairly and squarely as possible – so that no brand or product has any real head start. Andrea Lawrence of Toulou – unceremoniously dragged by yours truly from her stand on the showfloor to receive her certificate – was equally shocked. And it wasn’t only Gold winners – Silver Winner Puti Smith of Purely Puti Products could barely contain herself at her success, and having beaten Weleda into bronze to boot! 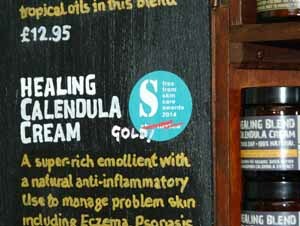 For Michelle and I, it’s the ‘small guys’ that really make the Awards, although we certainly couldn’t do it without the ‘big guys’ either – not only major entrants such as Neal’s Yard Remedies, Green People, Weleda and others, but sponsors such as Spiezia and NATorigin too, all of whom not only produce exceptional ‘free from’ skincare products, but understand the industry, its people and its consumers so well. The presentation went well – I was stressed, Michelle was calm, but some of the photographs belie the reality! 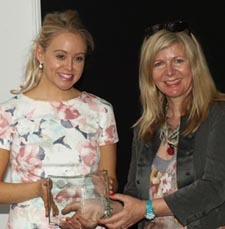 – and it was great to have natural living ambassador Janey Lee Grace for a third year, presenting certificates to winners. As for the show itself, it was a terrific success. Wider aisles meant for far more room on the show floor and visitors appeared to enjoy themselves more, and have more time to look around more calmly. We attracted many skincare fans to our stand to try out some of the balms and creams which were shortlisted, and take away samples from Moa (silver medallists in Family Skincare), Suti (bronze in Face Care (leave on)), Weleda (bronze in Hair Care) and Green People (bronze in Men’s Grooming), plus a fair number of bloggers and journalists who took away our press packs with samples from NATorigin, Spiezia and Beatitude. The Winners! – click here. The Pictures! – click here. Well done to all the winners and many thanks to Alex who works tirelessly on the awards and social media on top of his day job, something as sponsors we also find challenging to a lesser extent yet incredibly rewarding! Thanks Michelle. Yep – it’s all worth it in the end! Thanks as ever for all your support.